The Stevie Wonder biography tells the story of a very talented musician who has earned the respect and admiration of his peers and millions of fans, despite being blind. Wonder is a consummate showman and has won enough awards to fill dozens of trophy cases. 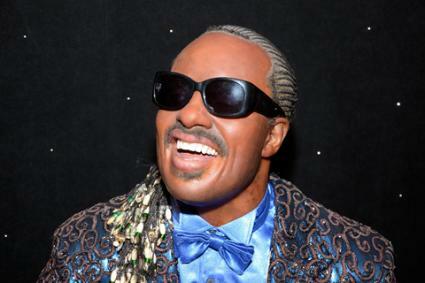 Stevie Wonder was born Stevland Hardaway Judkins on May 13, 1950, in Saginaw, Michigan. He has two younger and three older siblings, and his parents are Lula Mae Hardaway Morris and Calvin Judkins. Wonder was born prematurely, and has been blind since birth. When Wonder was four years old, his parents separated. Since then his legal last name has been Morris. When he was just seven years old, Wonder began playing piano and soon discovered that he was a natural. After only two years, he was playing at a skill level unheard of for kids his age. He quickly progressed to teaching himself to play harmonica, bass, and conga drums, and was an active voice in his church choir. Ronnie White, a member of the Motown group The Miracles, heard Wonder singing at age eleven. White recognized this incredible talent and arranged a meeting with Wonder, his mother, and Berry Gordy Jr., Motown's CEO. In 1961, Little Stevie Wonder released his first single, I Call it Pretty Music, But Old People Call it the Blues. In 1962, two full-length albums were released, but they were not to become instant hits. During the 1960s, Wonder also explored the world of songwriting, composing songs for himself as well as other Motown artists. He penned the massive hit single Tears of a Clown for Smokey Robinson and the Miracles. One of the most overlooked aspects in the Stevie Wonder biography is his influence in gaining creative control over his own work from the record company. In 1971, Wonder argued with Berry Gordy over this issue, and eventually left Motown because of it. During that time, he released two independent records, and eventually resigned with Motown in 1972. This time, however, he has complete control over his own career and held onto the rights to his songs, breaking down barriers for musicians and musical groups to come. Having already proven himself as a master of singing, songwriting, and playing music, Wonder settled in to a comfortable period in his career, where he could really pick and choose what he wanted to do. In 1982, Wonder recorded the duet Ebony and Ivory, with former Beatle Paul McCartney. In 1984, Wonder's I Just Called to Say I Love You appeared on the soundtrack for the film The Woman in Red. The song hit #1 all over the world and remains one of Wonder's most recognizable songs. In 1985, Wonder collaborated on the writing of the song We Are the World, recorded by a collection of artists under the name USA for Africa. Proceeds from the single went towards famine relief. Today, Wonder has seven children by three different women, and is currently married to Kia Millard Morris. He is still recording and writing songs, and works on behalf of a variety of humanitarian causes. Stevie Wonder and his music have become not only iconic, but also inspirational to musicians from all genres. From growing up with a disability in Michigan to the opulent world of superstardom, he has remained humble and throughout his storied career.